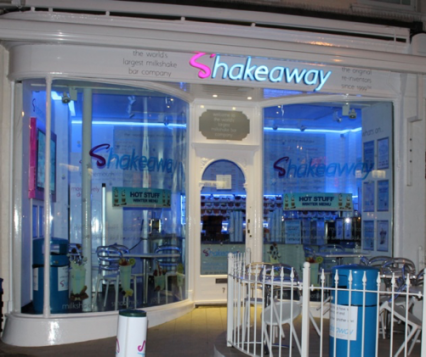 Bournemouth store is Shakeaway's first ever store! This store is small but mighty, full of shakettes with passion shaking from their hearts. Don't be scared to ask for a recommended combo these shakettes know only the best… We have milkshakes, smoothies, fit & healthy shakes, 100% fat free frozen yoghurt desserts that eat more like an ice cream, refreshing shaved ice at less than 160 calories per serving, and not forgetting our crispy, lower fat, tasty fries. Please note on bank holidays times may vary please contact store directly to find out this information. clogged up the blender and exploded, all that was left was de brie. This is our lovely new shakette Gabriella! She's a long lost member of the Kardashian family and is godmother to North West. Gabriella has a black belt in karate and can karate chop chocolate bars for our shakes super fast! This is J, yes, his full first name is just J - very unique! He loves a daim bar shake, especially the named shake ben! J’s favourite hobby is spinning and breathing fire - if he could be a supernatural being, he would be a dragon.